Right angle connection. With screwthread tubing connector which has a 9mm o.d nozzle. Straight connection. With screwthread tubing connector which has 9mm o.d nozzle. Straight. 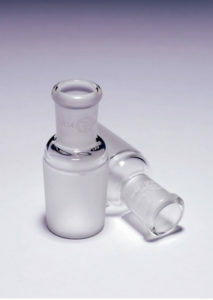 Suitable for locating plain stem thermometers. This range may also be used as simple stirrer guides provided the silicone ring seal within the screwcap is lubricated. GP Rotaflo key, bore 3mm. Supplied complete with screwthread connector which has a 9mm o.d. nozzle for tubing attachment. Supplied complete with screwthread connector which has a nozzle for tubing attachment. With multiple connection (pig) and screwthread vent connection. Supplied complete with screwthread connector which has a nozzle for tubing attachment. With GP Rotaflo stopcocks and screwthread vacuum connection. For vacuum distillation work. It permits receiver flasks to be changed without disturbing the vacuum within the system.